Normal is so 2010. These days people are jazzing up everything they own, from homes to cars to guns to tanks. If it has mass, you can pimp it. Slightly less expensive than getting the guys from TANKED to build you a reef inside of an Port-A-Potty, you can have this fancy goldfish bowl that just screams “I cancelled my Maxim subscription in favor of Vanity Fair”. 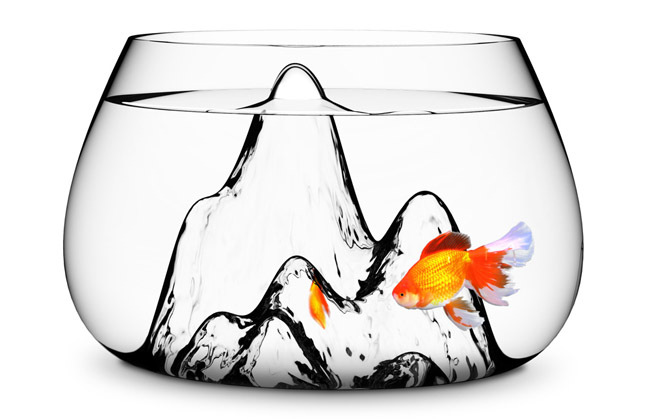 This glass bowl, designed by artists Gaia and Gino, is a big improvement on the classic goldfish bowl, and sure to impress your friends.